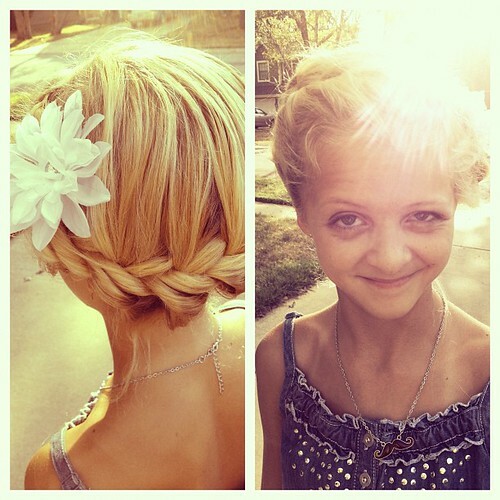 Hair Obsessed: Super cute updo for prom or wedding. Did my cute niece's hair, and she reciprocated with the evil eye ;) @sloanie764 #onefunthing, a photo by Crazybananas on Flickr. Absolutely an amazing updo. Reminds me of Goldie Hawn from Laugh in. This would be perfect for a bride at a beach wedding or bridesmaids. Also, perfect for a junior or senior prom. LOve this. And beautiful blond hair. Cute updos for girls, women, proms, dances. braided braid back and back view.